The second Tshwane Mediaeval fayre will be held at Toutrekpark on the 6th of November 2010. 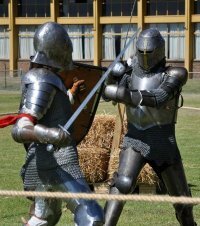 The fayre will be hosting armoured fighting and displays of mediaeval weaponry skills. Stunt shows will be performed on the day. A mediaeval village will have displays of olden day crafts such as blacksmithing and armoury. There will be a mediaeval type flea market, good food and a beer tent with live music. Highland dancers, firedancers, jesters, wizards and all sorts of other mediaevally type entertainment. Come , and let?s make this a day to remember! R40 gets you in if you're all grown up, and R25 if you?re under 12. Family groups of 4 or more qualify for discount.